Fire Warden - F.A.S.T. Rescue Inc.
All employers have a duty to ensure the safety of their staff and any visitors to their workplace. This includes having an emergency plan and training staff so that they understand their role in an emergency. Any good Emergency Plan will depend on staff knowing what to do in the event of a fire, and will almost certainly mean that some staff have particular roles and responsibilities as Fire Wardens. This may include specific duties in an evacuation, but it could also mean specific responsibilities for ongoing safety or fire prevention. Proper fire warden training for these individuals to ensure they have the knowledge they need to carry out their duties. 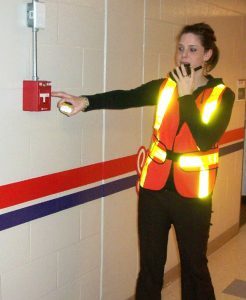 Course Content: Understanding the requirement of Fire Wardens; Review of the Emergency Coordinator, the Fire Wardens and the locations; Duties of the Fire Warden; Locations of the Fire Extinguishers, Pull Stations and Evacuation Map; Fire Door Separation; Protocol for exiting the building; Dealing with persons with special needs; Emergency Employee Assembly Areas and Fire Department Responsibilities.